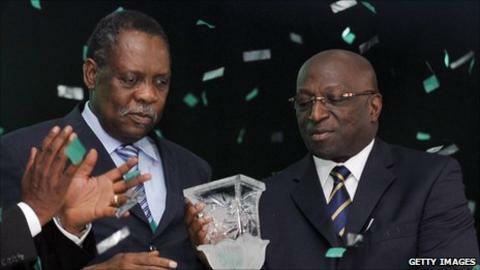 Caf president Issa Hayatou (left) and Jacques Anouma have been accused of taking bribes. Two of African football's most powerful men have been accused of taking bribes related to Qatar's 2022 World Cup bid. Confederation of African Football (Caf) president Issa Hayatou and executive committee member Jacques Anouma were reportedly paid $1.5m by Qatar. The accusations were heard by British MPs at the culture, media and sport committee in the House of Commons. MP Damian Collins said the evidence against the Fifa pair was submitted by the Sunday Times newspaper. Collins said: "The Sunday Times' submission, and this is to be published by us later, claims that $1.5m [£916,000] was paid to Fifa executive committee members Issa Hayatou and Jacques Anouma who went on to vote for Qatar." Hayatou, a Cameroonian, has led Caf since 1988 while Ivory Coast's Anouma has been on the confederation's executive committee for the last four years. When the British parliament did publish the newspaper's submission, it claimed 'that a similar deal had been struck with Amos Adamu, although he was prevented from voting because he was suspended following our original article'. In its evidence, the Sunday Times said a whistleblower who had worked for the Qatari had told its reporters that the cash would go to the three members' football federation - but 'there would be no questions asked about how the money was used'. Qatar, which beat the United States in the final round of voting for the 2022 finals, later issued a statement denying the 'serious and baseless' allegations that will 'remain unproven because they are false'. Last year, Fifa's ethics committee banned Nigeria's Adamu and Tahiti's Reynald Temarii following a Sunday Times investigation into World Cup bidding. Adamu, who denies the claims and has taken his case to the Court of Arbitration for Sport, was banned for three years for seeking bribes from undercover reporters. The information submitted to British lawmakers also claimed that Qatar employed an African fixer with close connections to Hayatou to arrange deals for votes. "In Cairo, [former Fifa Secretary General Michel] Zen Ruffinen introduced the reporters to an acquaintance called Amadou Diallo," read the statement. "Zen Ruffinen claimed that Qatar was using Diallo to arrange financial deals with the African members in exchange for World Cup votes. "Further inquiries established that Diallo had been employed by the Qatar bid and was also the "charge de mission" (chief assistant) to Issa Hayatou." The latest developments mean no fewer than eight executive committee members - one third of the total of 24 - have either been alleged to have been or already found guilty of impropriety in relation to the 2018 and 2022 World Cup bids. Fifa president Sepp Blatter, whose post is up for re-election on 1 June, has said he will ask for the evidence, which he will then forward to the ethics comittee. "We must have the evidence and then we will act immediately against all those (who) would be (in) breach of the ethical code rules," the Swiss said on Tuesday. Blatter is facing a challenge from Qatar's Mohammed Bin Hammam for the Fifa presidency.